Each beautiful Dog Tutu is sewn and not knotted! Please check back with us as we will be adding more tutus and dresses with tutus in the coming weeks. Please contact us if you have any questions or special requests. Classic Turquoise Tutu for Dogs with Zebra Striped Bow This tutu has beautiful layers and layers ..
Classic Willow Green and Eggplant Tutu for Dogs is simply gorgeous! This dog tutu has layers and .. Your dog will be the talk of the town in this pet tutu. 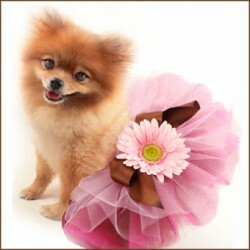 The dog tutu that's perfect for sprin.. Your Pup Will Be Perfectly Precious in Pink! This tutu is made with layers of hot pink tulle and ..